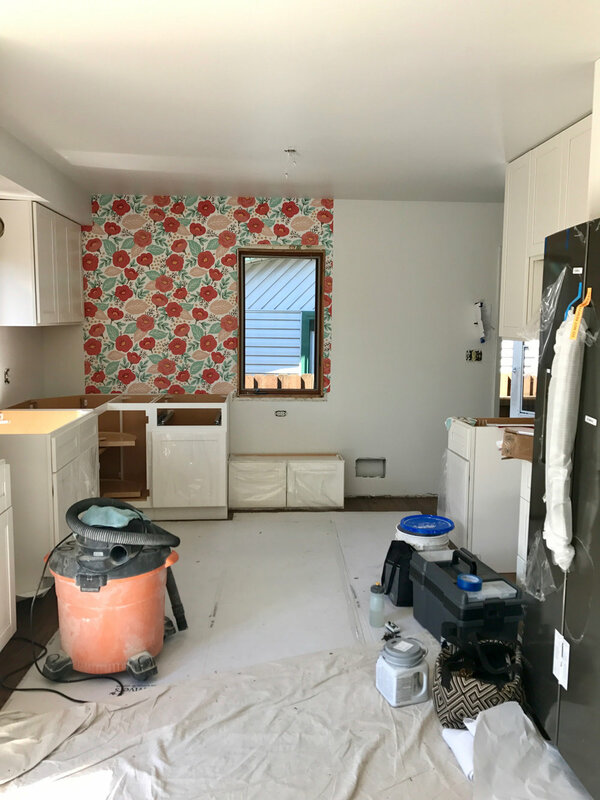 The kitchen in this flip house was extremely outdated and in need of some major renovations. It was an easy decision to completely gut it and start with a clean slate. We took this kitchen from a dated disaster to a fun and functional space. Like the bathroom in this flip house, we went bold with our design choices while sticking to our budget. Here are a few before and progress photos. Out with the old and in with the new. 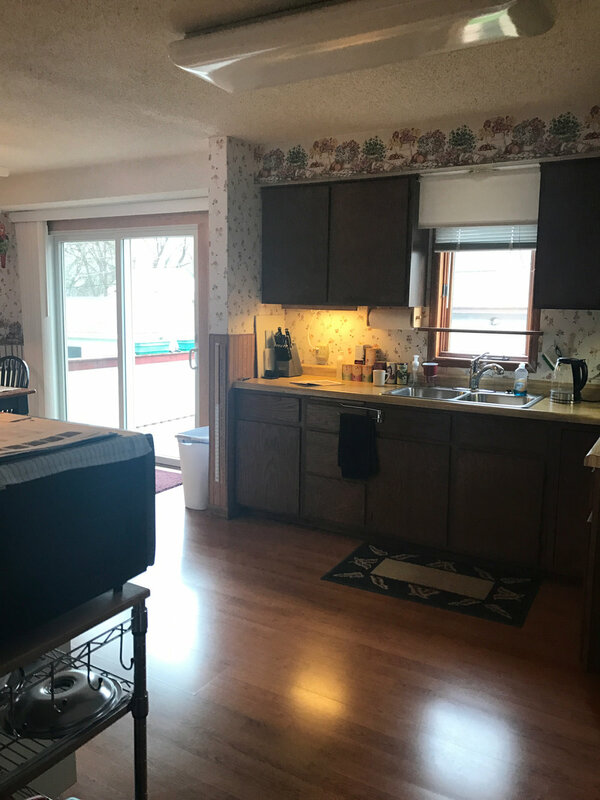 We removed the countertops and dark cabinets, ditched the dated wall paper, ripped up the flooring, scraped the popcorn ceilings and replaced all of the appliances and fixtures to give this space a fresh start. And here are the afters! Would this kitchen have been pretty with just white cabinets, grey countertops and black accents? Sure. But that's what everyone does. To make our mark on this space we had to bring in some drama, and one of our favorite budget-friendly tricks is with removable wallpaper. We found these two from Wallsneedlove and while one might think they're pretty different styles they both use thin black lines, which we used as the "style-unifier" (It's a phrase. Promise. But sure, we made it up). These provided the graphic punch we needed to bring this space to life. We used green and black throughout the house so that the style is consistent throughout the house. By putting these on opposite walls in the kitchen you're seeing both the green and black from the adjoining rooms. The shot above faces one direction while the shot below faces the other so you can get the idea of how these wallpapers flank each other. We added a black metal and wood shelving unit, which is both on trend, but also brings a natural element into the space to soften things up while also providing extra storage (for displaying all your cute stuff, of course!). You may have noticed from the before and progress pics that the kitchen was the only living space without real hardwood floors. After demo we laid all new hardwood throughout the kitchen. We went with a darker stain because not only does it bring a warmth to a pretty white space, it also covered a lot of stains in the original wood floors that wouldn't sand out (Check out the before photos. Yeah, it was bad). We went with neutral grey quartz counter tops that don't compete with the wallpaper, but still stand out against the white cabinets. Not only are they perfect for the space but they are also affordable. When we put together the design for the kitchen we made sure to keep in mind which materials we could get that took into account these three key things: 1) today's top design trends. 2) affordability. 3) great quality. We could have gone with the basic white subway tile backsplash, but we decided to try something unique. Although each of the tiles are standard builder-grade materials, we laid them in a unique way that makes a design-forward choice but at great price point. To make the backsplash even more interesting we took a tile edging piece, painted it brass, and stuck in the middle. This adds another cool design element to the space along with some great dimension. We said goodbye to the dark wood cabinets and replaced them with these white shaker style cabinets. These are a hot trend right now, but also a classic design choice so you really can't go wrong. They also look great against the brand new stainless steel appliances. Of course we had to throw in some black around the room. We are digging black faucets right now (check out the bathroom faucet too!). We kept most of the black accents in the light fixtures. None of these are a matching set, but that's alright! In fact, they were originally brass that we spray painted black. When in doubt, spray paint is a great style-unifier. See, there's that term again. One way to add some subtle variation to a dining area is to mix-and-match the chairs. Wishbone chairs are one of our favorite styles. Not only are they comfortable but they're also great for small spaces and the natural seat brings a softness and textural element to the space. We contrasted the wishbone chairs with two sleek, bentwood chairs. We spray painted the legs black to make them more sophisticated as well as to match the legs of the wishbone chairs. We spray painted this IKEA light mint green to tie in the wallpaper and move the color around the room. This is a $10 light, folks. $10! So once again, spray paint is our friend. Do you think there's an affordable mint green chandelier out there? Nope. And let's not forget about our friend in the corner. This large plant helps soften space and carries the color green from one side of the room to the other. This wood shelving unit from Wayfair adds a warm, natural element to the space and serves as a great spot to store and display your everyday items in a cool way. Staging 101 - what do you see here? 1) plants for natural elements. 2) various textures but all in the same colors we're using throughout the room (black, white, green). 3) some pasta because it's a kitchen (duh) and an affordable way to fill shelf space. We're firm believers in using real plants when we stage a house because it gives the house a lived-in feel. If that means we have to run over to the house once a week to water them for a month until the house sells, then so be it. We know it helps the house sell faster and for top dollar. And what buyer doesn't like a cute succulent arrangement in front of them as they sit at the table with their realtor deciding to buy the house? Am I right? Check out these side-by-side before and after photos!